TICKETS AVAILABLE & ON SALE NOW!! TICKETS ARE AVAILABLE & ON SALE NOW!! 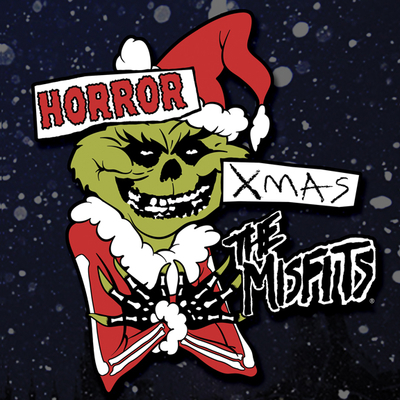 The voice of the Fiends has been heard, and due to unprecedented demand, the Original Misfits have added another show, doing everything within their power to help ensure Fiends have a solid opportunity to get tickets. To increase your chances, act quickly and get yours as soon as possible. Tickets are readily available to fans all over the world NOW, but we cannot make any assurances on how long they will last—so don’t delay. Tickets start at $39.75 and up, with VIP tickets at $255, (not including applicable service charges or fees). 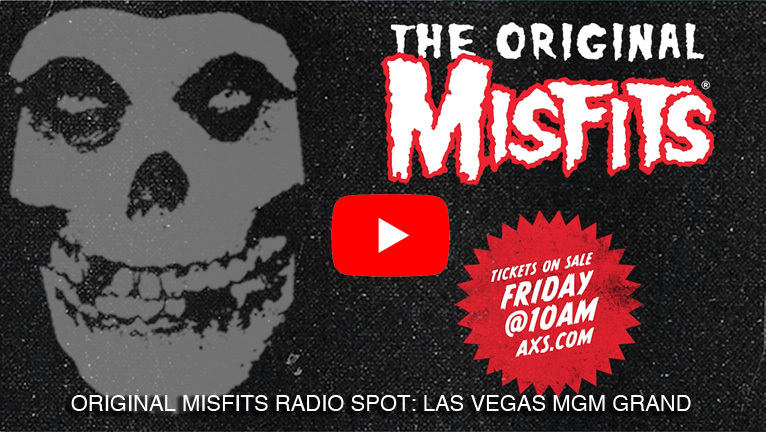 In a ‘Record Breaking’ less than 60 seconds of the general public ticketing for The Original Misfits at the Forum on 12/30, every single seat was sold out. 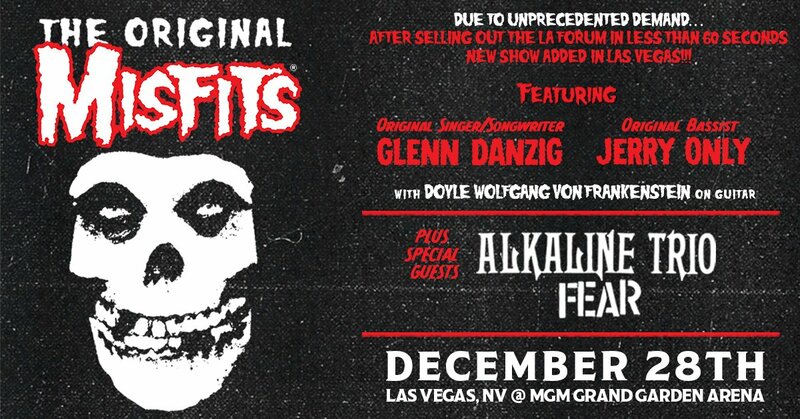 Now due to unprecedented demand, The Original Misfits have announced the addition of a New Show on 12/28 at the MGM Grand Garden Arena in Las Vegas. 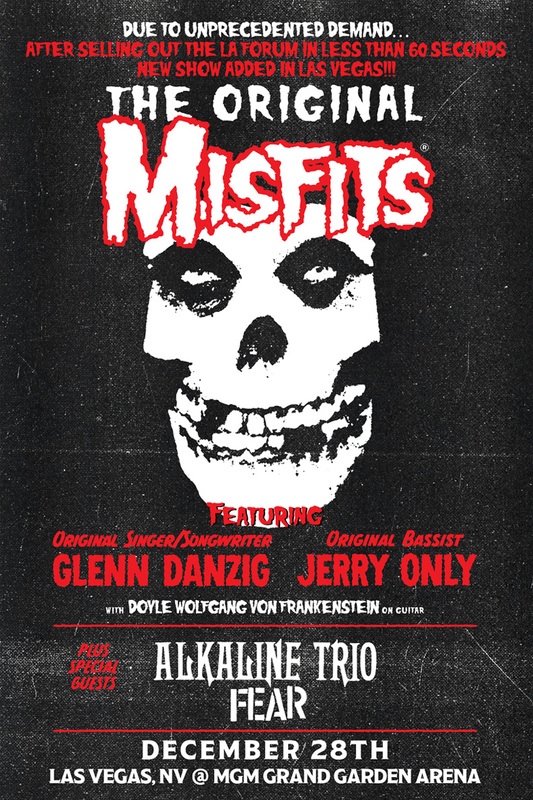 These incredibly highly-anticipated shows reunite original singer/songwriter Glenn Danzig and original bassist Jerry Only, along with Guitarist Doyle Wolfgang von Frankenstein. This unprecedented reunion and lineup has resulted in the legendary horror-punk trailblazers/modern-metal pioneers being one of the hottest tickets of 2017. As previously announced at the Forum, filling out the line-up for these monumental shows, fans will find preeminent drummer Dave Lombardo seated behind the kit with The Original Misfits once again. Rooted within the worlds of both thrash-metal and punk-rock, Lombardo, (the original drummer and co-founding member of Slayer), is perfectly suited to the ferociously diverse beat of The Original Misfits. 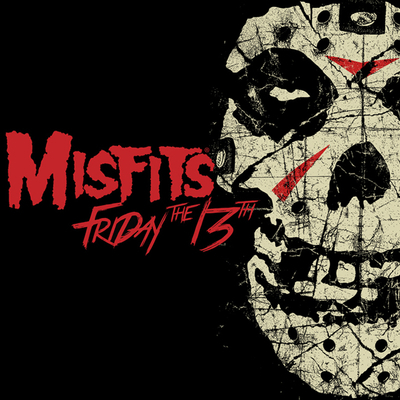 Lombardo will reprise his role on drums from the record breaking 2016 Original Misfits reunion performances, as will Acey Slade (former Joan Jett and the Blackhearts) on second rhythm guitar. Tickets ranging in price from $39.75 – $255 (not including applicable service charges or fees) are available and on sale to the general public NOW at axs.com. The MISFITS with Danzig’s anthemic songs and unmistakable voice, Only’s ferocious bass sound, and the Original MISFITS melody-induced choruses and authentically bruising musicianship, cemented their importance with all ensuing generations. And now legions of diehard fans from around the world will have the opportunity to hear the Original Band that forges a level of intensity unprecedented in the new millennium. Don’t miss this important chapter in the legendary band’s legacy of brutality. GET YOUR TICKETS NOW FIENDS!